Stocksbridge has never been a happy hunting ground for ‘Ensians with its sloping pitch high in the hills above Sheffield and this encounter proved to be no exception. On top of this, the visitors were conscious of the fact that the home side was responsible for one of only two defeats suffered by League leaders Old Grovians earlier in the season. On a fine afternoon the taller and heavier home pack completely dominated proceedings in the scrums forcing ‘Ensians to live on limited and often untidy possession for long periods. Although the visitors competed well at times, there was an all-round lack of cohesion and frequent handling errors played into the hands of the heavy home forwards. The hosts scored three converted tries playing with the slope in the first half to one by ‘Ensians and they were awarded a penalty try in the scrappy second half. The visitors started well up the slope gaining territory with forwards and backs linking well. Despite the dry conditions, both wingers were guilty of dropped passes when early ball came their way. The resulting scrums gave Stocksbridge opportunities to push the ball downfield and a driving maul saw them trundle over the line for a converted try for a 7 – 0 lead on 10 minutes. 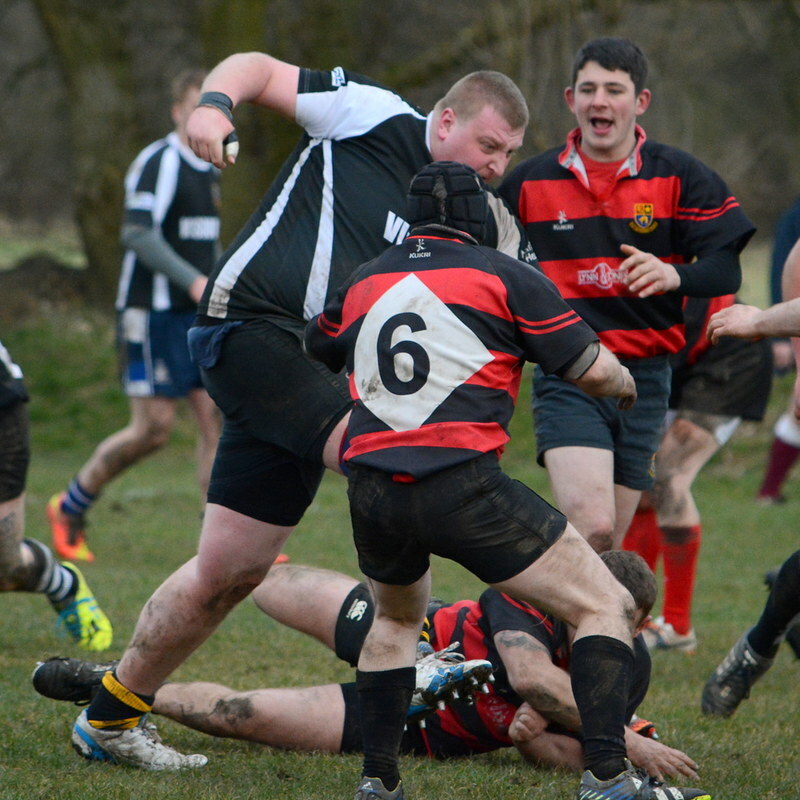 From the re-start, ‘Ensians secured possession with scrum half Rob Lofthouse opening things up. Lively lock Matt Taylor made a good run up the right flank and offloaded to winger Declan Jackson who rounded the cover to score out wide. The conversion failed, but the visitors were on the scoreboard at 7 – 5 on 12 minutes. ’Ensians were competing well in the lineouts through lock Ali Campbell and flanker Sam Featherstone and although half backs Lofthouse and Ollie Eaves tried to get their back line moving, slow passing and determined defence meant that moves came to nothing. With a plentiful supply of ball, the home side were dominating territory and from a lineout their drive was held up over the line on 20 minutes. The visitors were working hard in defence through the back row of Ollie Cooper, Rob Arbuckle and Feathersone, but they ended up being pinned down in their own 22 for long periods. A scrum near the line gave the home pack another opportunity and they drove over for their second try on 24 minutes, with the conversion taking the score to 14 – 5 in their favour. The lighter visiting front row of Josh Dyson, Jim Dyson and Paddy Phipps worked hard during a difficult afternoon and, although they did command some of their own ball, scrum half Rob Lofthouse frequently had to deal with a retreating scrum. Just when it looked as though ‘Ensians were beginning to take play into midfield and regain some degree of control, a turnover and a missed tackle allowed the home centre to run in under the posts to stretch the lead to 21 – 5 on 33 minutes. This seemed to spur on the visitors who started putting together some good drives and offloads to take play into the home 22. A blindside back move saw the ball whipped out to winger Will Howarth who was knocked into touch as he dived for the corner, leaving the half-time score at 21 – 5 to the hosts. After the break and with the slope, ‘Ensians wasted no time in driving play into the home half through the boot of Ollie Eaves and some good forward play. The problem was that attempts to spread the ball wide frequently came to nothing through slow or inaccurate passing with the result that when speedy wingers Jackson and Howarth were put away, the cover was able to get across and snuff out the moves. The visitors did manage to exert pressure near the home line, but attacks by both forwards and backs lacked co-ordination and the home defence held out. Newcomer Ali Fothergill came on at lock for the visitors and showed his power and pace with some strong attacking runs as Stocksbridge were pressured in their own half and Jack Graham took over the hooking role from Jim Dyson. Prop Paddy Phipps jinked his way through to be pulled down just short of the line and then centre Nathan Rogers put winger Howarth in the clear only for the referee to blow up for a forward pass. ‘Ensians should really have had some points on the board for this pressure, but the failure to do so gave Stocksbridge confidence as their forwards and backs combined well to push play upfield. A turnover gave ‘Ensians the ball in their own 22, but a downfield clearance kick was charged down and gathered by the home side who inter-passed and narrowly missed scoring in the corner. The visitors knocked on at the subsequent lineout and as they struggled to prevent a pushover try, they were twice penalised for offside before the referee awarded a penalty try to extend the lead to 28 - 5 on 67 minutes. ‘Ensians continued their efforts to get back on the scoreboard, but play was untidy with the result that the defiant home defence held out to leave the final score at 28 – 5. Stocksbridge away is never an easy game, but ‘Ensians will be extremely disappointed by this lack-lustre display littered with errors and wrong options.